Ramon John Hnatyshyn (Ukrainian: Роман Гнатишин Roman Hnatyshyn) PC CC CMM CD QC (Can) QC (Sask) FRHSC(hon) (/nəˈtɪʃən/; March 16, 1934 – December 18, 2002), commonly known as Ray Hnatyshyn, was a Canadian statesman who served as Governor General of Canada, the 24th since Canadian Confederation. Hnatyshyn was born and educated in Saskatchewan and served in the Royal Canadian Air Cadets prior to being elected to the House of Commons in 1974, whereafter he served as a minister of the Crown in two non-successive governments until 1988. He was in 1989 appointed as governor general by Queen Elizabeth II, on the recommendation of Prime Minister of Canada Brian Mulroney, to replace Jeanne Mathilde Sauvé as viceroy, and he occupied the post until succeeded by Roméo LeBlanc in 1995. As the Queen's representative, Hnatyshyn proved to be a populist, reversing some exclusive policies of his predecessor, such as opening up Rideau Hall to ordinary Canadians and tourists alike, and was praised for raising the stature of Ukrainian Canadians. On June 4, 1979, Hnatyshyn was sworn into the Queen's Privy Council for Canada. He subsequently practised law and sat as Chancellor of Carleton University before dying of pancreatitis on December 18, 2002. Hnatyshyn, a Ukrainian Canadian, was born in Saskatoon, Saskatchewan, to Helen Hnatyshyn and her husband, John, whose political links and friendship with John Diefenbaker, the future prime minister, would provide his son with frequent exposure to high-calibre political debate. Hnatyshyn attended Victoria Public School and Nutana Collegiate Institute, and enrolled in the Royal Canadian Air Cadets, where he was a member of 107 Spitfire Squadron in Saskatoon. After graduation from high school, went on to attend the University of Saskatchewan, earning there in 1954 a Bachelor of Arts and, two years later, a Bachelor of Law. On January 9, 1960, Hnatyshyn married Karen Gerda Nygaard Andreasen, eventually having and raising two sons with her. Two years after he was called to the bar of Saskatchewan in 1957, Hnatyshyn's family moved to Ottawa upon his father being summoned to the Senate. There, Hnatyshyn worked for his father's law firm while also lecturing at the University of Saskatchewan's College of Law. However, he eventually set these jobs aside in order to make a successful bid as a Progressive Conservative Party candidate in the 1974 federal election from Saskatoon—Biggar in the House of Commons. When that seat was abolished ahead of the 1979 election, Hnatyshyn followed most of his constituents into Saskatoon West for another two terms. Saskatoon West was abolished before the election of 1988, and Hnatshyn attempted to follow most of his constituents into Saskatoon—Clark's Crossing, but lost to New Democratic Party challenger Chris Axworthy. During his time in Parliament, he was appointed first, on April 2, 1979, to the Cabinet chaired by Joe Clark (as Minister of Energy, Mines, and Resources), and then to that headed by Brian Mulroney (as Minister of Justice) on June 30, 1986, the same year he was called to the bar of Ontario. It was on December 14, 1989, that Queen Elizabeth II had, by commission under the royal sign-manual and Great Seal of Canada, appointed Prime Minister Brian Mulroney's choice of Hnatyshyn to succeed Jeanne Sauvé as the Queen's representative. He was subsequently sworn-in during a ceremony in the Senate chamber on January 29, 1990. Hnatyshyn thereafter made an effort to open up Rideau Hall—the monarch's and governor general's residence in Ottawa—to the public, establishing a visitors' centre and initiating guided tours of the palace and the royal park in which it sits. These moves marked a complete reversal of the policies of Hnatyshyn's predecessor, who had closed Rideau Hall to the general public. In 1991, Hnatyshyn staged on the grounds the first of the annual Governor General's Summer Concert Series and, the year after, mounted His Excellency's Most Excellent Rock Concert and re-opened the skating rink to the public. These events blended with some of Hnatyshyn's self-imposed mandates during his viceregal tenure, which included a desire to engage Canadian youth and focus attention on education and to encourage the arts. In these veins, he established in 1992 the Governor General's Performing Arts Award, the Ramon John Hnatyshyn Award for Voluntarism in the Arts, and the Governor General's Flight For Freedom Award for Lifetime Achievement in Literacy. Further, he founded the International Council for Canadian Studies, the Governor General Ramon John Hnatyshyn Education Fund, the Ramon John Hnatyshyn Award for Law, and the Governor General's International Award for Canadian Studies. Among numerous other official and ceremonial duties, the Governor General presided over celebrations to mark the 125th anniversary of Confederation and welcomed to Rideau Hall the Prince and Princess of Wales, along with a host of foreign dignitaries such as President of Russia Boris Yeltsin and King Hussein and Queen Noor of Jordan. Further, Hnatyshyn undertook a number of state visits, including one to Ukraine, before his time serving at Her Majesty's pleasure ended on February 6, 1995. Throughout his tenure as the Canadian viceroy, Hnatyshyn was both defended and criticised by the Monarchist League of Canada. In their final summary of Hnatyshyn's years in office, though, the former governor general was generally viewed to have not stood up for the Canadian Crown that he represented, choosing to follow, instead of Vincent Massey's example, that of Sauvé, who was herself seen as a republican. This lack of loyalty, it was argued, left Hnatyshyn with few defenders when he was targeted by members of the Reform Party for his salary and taxes. It was thought by John Pepall that Hnatyshyn's name had been selected by Mulroney to put forward to the Queen for appointment as governor general because Hnatyshyn, who had just recently been a member of the Cabinet headed by Mulroney until losing his parliamentary seat in the 1988 election, was someone Mulroney could "hardly feel any deference for", allowing Mulroney to continue to show the "juvenile extreme of the politician's craving for publicity and centre stage" he had while Jeanne Sauvé was governor general. After his departure from Government House, Hnatyshyn returned to practicing law at the firm of Gowling, Strathy & Henderson, where he had previously worked between 1989 and 1990. 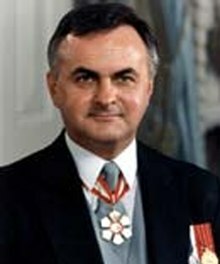 In 2002 he was installed as Chancellor of Carleton University in Ottawa, however, only months later, shortly before Christmas, Hnatyshyn died of pancreatitis. Per tradition, and with the consent of his family, Hnatyshyn lay in state for two days in the Senate chamber, and, though he was Ukrainian Orthodox, he was commemorated in his state funeral in a multi-faith ceremony on December 23, 2002, at Ottawa's Christ Church Cathedral. The service included the funeral rite of the Ukrainian Orthodox Church—officiated by Archbishop Yurij, Bishop of Toronto, and the clergy of the Ukrainian Orthodox Church—and a eulogy from the Canadian Broadcasting Corporation's chief correspondent, Peter Mansbridge, and Adrienne Clarkson, by that time the sitting governor general, paid tribute to one of her predecessors via video, as she and her husband were en route to spend Christmas with Canadian troops stationed in the Persian Gulf. Hnatyshyn was then buried at Beechwood Cemetery in Ottawa. Various memorials followed Hnatyshyn's death: On March 16, 2004, Canada Post unveiled at a ceremony, attended by Hnatyshyn's widow, a $0.49 postage stamp designed by Vancouver graphic artist Susan Mavor, and bearing the formal portrait of Hnatyshyn taken by Canadian Press photographer Paul Chaisson on the day Hnatyshyn became governor general, along with a tone-on-tone rendering of part of Hnatyshyn's coat of arms. Two years later, a 48-minute documentary DVD examining the life of Hnatyshyn, A Man for all Canadians was released in Canada by IKOR Film. Just prior to his installation as Governor General, Hnatyshyn was granted a personal coat of arms that depicted his Ukrainian and Canadian roots. The colours and split division of the shield and supporters harkens to the flag of Ukraine, where Hnatyshyn's family originated. In the shield, the viceregal lion recalls Hnatyshyn's appointment as the Queen's representative, and the lion below is drawn from the coat of arms of Denmark, where Hnatyshyn's wife's father was from. The red lion comes from the coat of arms of Saskatchewan, where Hnatyshyn was born, the two maple leaves on the lion's shoulders (one visible) represents Hnatyshyn's two sons, and the scales it holds recall Hnatyshyn's profession as a lawyer. The deer is the same, in form, as that on the coat of arms of Saskatchewan, and the badge on its medallion is that of the House of Commons, where Hnatyshyn sat as a Member of Parliament. The bull is a symbol of Bukovina, where Hnatyshyn's parents were born, and from its collar hangs an emblem that links Saskatchewan's official flower—the prairie lily—with the trident of the Ukrainian coat of arms—a symbol of the Ukrainian people for more than 1,000 years. ^ Pepall, John (1 March 1990). "Who is the Governor General?". The Idler. Toronto. Archived from the original on 6 July 2011. Retrieved 15 July 2015. ^ "Over 500 Degrees to be Conferred" (Press release). Memorial University of Newfoundland. October 20, 1994. Retrieved March 4, 2009. ^ "2005 Honorary Degree Recipients Named" (Press release). University of Northern British Columbia. April 21, 2005. Retrieved March 4, 2009.